© 2017 Portelli et al. Oxidative stress is a pathologic event induced by a prevalence of oxidant agents on the antioxidant ones, with a consequent alteration of oxide-reducing balance. Freeradicals produce damages both in cellular and extra-cellular components; phospholipid membranes, proteins, mitochondrial and nuclear DNA, are the target of the oxidative stress, that can finally cause cellular death due to apoptosis. Orthodontic appliances such as brackets, wires, resins and soldering have some components that can be considered as potential allergen, carcinogenic, cytotoxic and gene mutation factors. The primary aim of this research is to evaluate oxidative stress in the saliva of patients treated with multibracket self-ligating vestibular orthodontic appliances; the secondary purpose is to investigate the influence of orthodontic multibracket therapy on oral hygiene and the consequent effect on oxidative stress. Salivary specimens has been collected in a sample of 23 patients were enrolled (12 Female, 11 Male) between 12 and 16 years of age (mean age 14.2). For each patient has been collected a salivary specimen at the following time points; before orthodontic bonding (T1), five weeks (T2) and ten weeks (T3) after orthodontic appliance bonding. Samples has been analysed with a photometer due to SAT Test (Salivary Antioxidant Test). Data obtained show a mean of 2971 mEq/l of anti-oxidant agents before orthodontic treatment, and after five weeks from the bonding the mean was decreased to 2909 mEq/l, instead at ten weeks was increased to 3332 mEq/l. Repeated measures ANOVA did not reveal statistically significant differences between the time points (P = 0.1697). The study did not reveal any correlation between the level of dental hygiene and that of oxidative stress (Pearson Correlation Coefficient R = 0). Orthodontic treatment with multibrackets vestibular metallic appliance seems to be not able to affect oxidative stress during the first ten weeks of therapy. Keywords: Oxidative stress, Multibrackets orthodontic appliance, Salivary antioxidant test, Extra-cellular components, Apoptosis. Superoxide Anion (O2*) is generated under both physiological and pathological conditions by neutrophils and macrophages . Hydrogen Peroxide (H2O2) is considered a relatively weak free radical and is produced in all systems that generate superoxide anion. Hypo chloric Acid (HOCl) can be neutralized to water (H2O) or metabolized by the myeloperoxidase enzyme and transformed into a strong oxidizing agent. This reaction is considered highly relevant in the inflammatory process, because the myeloperoxidase protein is one of the most represented proteins in the phagocytes . Hydroxyl Radical (OH*) is considered the most active free radical. In competition with H2O2, it inactivates mitochondrial enzymes and causes direct damage to DNA. Considering the short lifetime and high level of reactivity, the damage produced by a free radical is usually limited to the tissue in which the radical is developed. The most important cellular targets of oxidative stress are the phospholipid membranes ; the increase in hydro peroxides inside the cellular membrane produces modifications in its fluidity, trans-membrane enzyme activity, transport canals, membrane receptors, and other proteins . Other important targets of free radicals are the proteins that represent the most plentiful cellular component; a simple modification of a single protein can produce an important effect on its functionality and biological activity . Nuclear and mitochondrial DNA are two other important sites of oxidative stress; chain fracture, base hydrolysis, ATP depletion, and genetic mutation are the most common modifications induced. Finally, oxidative stress can produce cellular death due to apoptosis  free radicals, however, also contribute to physiological activity of the human organism such as immune system stimulation, blood pressure regulation, intra- and extracellular communication, and the synthesis of hormones such as catecholamine. Several factors, such as radiation, pollution, smoke, viruses, and bacteria, can modify oxido-reductive balance on the side of the oxidant species, producing oxidative stress; this is at the root of several human diseases, such as diabetes, atherosclerosis, hypertension, colitis, rheumatoid arthritis, etc [8, 9], and plays a fundamental role in aging . Denham Harman proposed a therapy regarding aging; according to this therapy, aging is considered a consequence of the accumulation of detrimental effects produced by reactive oxygen species (ROS), and the capability of the organism to contrast these effects plays a fundamental role in life span . Several diseases, such as Alzheimer’s , Parkinson’s, Huntington’s , and Steiner’s  seem to be related to mitochondrial defects induced by oxidative stress. The oxidative stress can be induced by X-Ray  and seems to be involved in the development of white spot lesions, enamel surface alterations, and dental caries, and the saliva can be considered the first barrier to oxidative stress; [16-21] the antioxidant capability of the saliva is essential for the maintenance of oral cavity balance and to avoid the development of local diseases. The primary aim of this research is to evaluate oxidative stress in the saliva of patients treated with multibracket self-ligating vestibular orthodontic appliances; the secondary purpose is to investigate the influence of orthodontic multibracket therapy on oral hygiene and the consequent effect on oxidative stress. 0 = Absence of plaque. 1 = A film of plaque adhering to the free gingival margin and adjacent area of the tooth. The plaque may be seen in situ only after application of a disclosing solution or by using the probe on the tooth’s surface. 2 = Moderate accumulation of soft deposits within the gingival pocket or the tooth and gingival margin, which can be seen with the naked eye. 3 = Abundance of soft matter within the gingival pocket and/or on the tooth and gingival margin. For the present study, a new photometer was used with an incorporated centrifuge (FRAS 5 EVOLVO : Free Radical Analytical System, H&D SPA, Italy), which utilizes D-ROMs, biological antioxidant potential (BAP) and the Salivary Antioxidant Test (SAT) for the evaluation of total oxidative stress. The D-ROMs test evaluates blood concentrations of metabolites and derivatives of oxygen (Reactive Oxygen Species, ROM) and in particular, hydro peroxide. The BAP (Biological Antioxidant Potential) test measures the efficiency of a plasmatic antioxidant barrier in terms of Fe-reduction activity. The SAT test is based on the capacity of a colored solution of Fe3+ to modify its coloring when Fe3+ has been reduced to Fe2+ due to the action of a reducing agent. A salivary sample was collected from fasting patients after at least 30 min from daily dental hygiene; in fact, foods and beverages such as coffee, tea, and fruit juice or the use of toothpaste can produce an alteration in anti-oxidant agents in the saliva. Before each sample, a small plastic glass and a square of cotton were weighed, taking note of the values registered. Patients were instructed to twirl the cotton in their mouth without biting, simulating chewing, in order to produce saliva. After 60 s, the small glass and cotton square were re-weighed, paying attention that the difference between the two measurements was in the range of 1.1 to 1.4 g.
This range corresponds to the optimal salivary fluid expressed in ml/min, in order to obtain the maximum antioxidant effect and a constant amount of uric acid (principal antioxidant salivary agent). The cotton was wrung out by hand in order to collect the salivary sample in the small glass; in a cuvette containing the R1 reagent, 30 μl of the R2 reagent was added using a designated pipette and single-use tip. The cuvette was closed, shaken for 10 s and then inserted into the reading camera of the apparatus for the first reading. At a later time, the cuvette was removed and 10 μl of saliva was added to the solution containing R1 + R2; the cuvette was closed one more time, shaken, and inserted again into the reading camera. The reference values for the SAT test are expressed in mEq/L of antioxidant agents. For the study, 69 salivary samples have been collected; three for each patient enrolled; SAT test results were analyzed statistically by the analysis of variance (ANOVA) for repeated measures. PI values were analyzed by chi-square test. Statistical significance was set to α = 0.05. The software used for the statistical analysis was PRISM 6 (GraphPad Software, California, USA). The results of the SAT test are reported graphically in Fig. (1) and the descriptive statistic of the data is reported in Table 1. Repeated measures ANOVA did not reveal statistically significant differences between the time points (P = 0.1697). Fig. (1). SAT Test results at the different time points. Table 1. Descriptive statistic (mEq/l). The results of the present study revealed a mean value of anti-oxidant agents in the saliva of patients before the treatment of 2954 mEq/l. Five weeks after bonding, the mean value reduced to 2903 mEq/l, instead 10 weeks after the beginning of the treatment, the mean concentration of antioxidant agents in the saliva increased to the extent of 3297 mEq/l. However statistical analysis did not reveal significant differences in the mean values of anti-oxidant agents among T0, T1, and T2. The distribution of the PI value in the study group, measured by the Silness-Loe gingival method, is reported in Table 2. 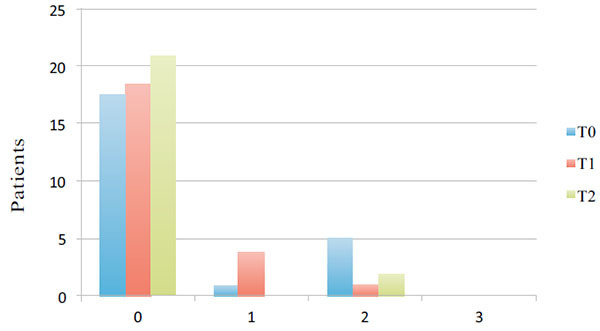 The distribution of the scores at the different time points is expressed graphically in Fig. (2). Statistical analysis performed by chi-square test did not reveal statistically significant differences between the groups (P > 0.05). Fig. (2). Distribution of plaque index scores at the different time points. Table 2. Distribution of plaque index value in patients at the different time point. The results show that no patients had a PI value of 3 (Abondance of soft matter within the gingival pocket and/or on the tooth and gingival margin) at any time point. 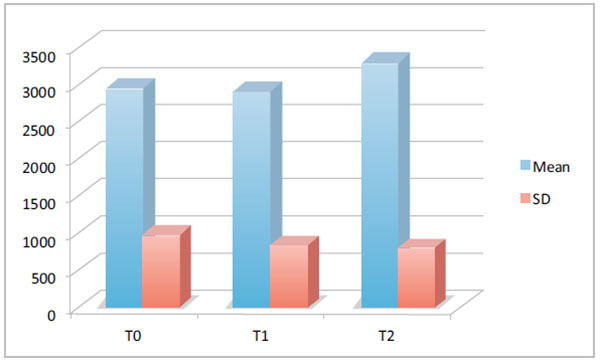 Patients with the scores of 0 maintained good oral hygiene at the following measurements: in the majority of patients with higher scores, the measurements at T1 and T2 were better; in some cases, the value remained the same. Considering worsening of dental hygiene during orthodontic treatment, the study did not reveal any correlation between the level of dental hygiene and that of oxidative stress (Pearson Correlation Coefficient R = 0). In the below table Table 3, the correlation between PI scores and SAT results is illustrated. Table 3. Correlation between plaque index scores and SAT results. The primary aim of this research was to evaluate oxidative stress in the saliva of patients treated with multi-bracket vestibular orthodontic appliances; oxidative stress is produced due to the prevalence of free radicals over antioxidant agents. Considering their short life time, is very difficult to quantify free-radical concentration; to date, the only way to assess oxidative stress is to evaluate the consequent damage or to measure the concentration of substances produced to defend the organism . In the literature, different studies are available [24-37] that describe the correlation between orthodontic therapy and the development of oxidant species. Some authors support that even if orthodontic brackets and wires are able to release harmful substances in the oral cavity, they are not cytotoxic; therefore, they do not produce oxidative stress [26, 27, 30]. Other recent studies [35-37] state that orthodontic brackets and wires produce an increase in free-radical concentration without producing acute toxicity, and stainless steel materials seem to be more biocompatible. The present research did not reveal statistically significant differences between the different Time Points. On the basis of the results obtained in this study, it is possible to state that multi-bracket, self-ligating orthodontic therapy with a vestibular appliance did not influence oral cavity oxidative stress in the first 10 weeks of treatment. The normal values of anti-oxidant agents in a healthy adult human subject are between 1500 and 2000 mEq/; however, the main part of the salivary sample collected at T0 revealed a higher value. These data could be related to the age of the patients: puberty is in fact characterized by important hormonal changes related to development  and by an increase in cellular metabolism related to the acceleration of somatic growth and sexual maturation. The secondary purpose of this research was to investigate the influence of orthodontic multi-bracket therapy on oral hygiene and the consequent effect on oxidative stress. An experimental study on the influence of dental caries and hygiene on the amount of oxidant agents  stated that oxidative stress in patients with insufficient oral hygiene and dental caries is higher than in patients without plaque and tooth decay. Even if multi-bracket orthodontic appliances, like other type od prosthetic restoration [39-41], usually produce an increase in dental plaque, in the present study, we observed an improvement in dental hygiene during orthodontic therapy; these data could be related to the correct instruction and the continuous monitoring of the patients enrolled in the study [42-43]. The study did not reveal any correlation between the level of dental hygiene and that of oxidative stress. In conclusion, it is possible to state that orthodontic multi-bracket therapy did not influence the oxidative stress in the oral cavity during the first 10 weeks of treatment; these data could also be related to the use of a self-ligating vestibular appliance, which reduces the forces exerted on the teeth and allows for better dental hygiene during orthodontic treatment. Halliwell B, Gutteridge JM. Free radicals in biology and medicine 3rd edition. Oxford University Press 1999. Cadenas E. Biochemistry of oxygen toxicity. Annu Rev Biochem 1989; 58: 79-110. Rosen GM, Pou S, Ramos CL, Cohen MS, Britigan BE. Free radicals and phagocytic cells. FASEB J 1995; 9(2): 200-9. Cohen AB, Chenoweth DE, Hugli TE. The release of elastase, myeloperoxidase, and lysozyme from human alveolar macrophages. Am Rev Respir Dis 1982; 126(2): 241-7. Jourd’Heuil D, Vaananen P, Meddings JB. Lipid peroxidation of the brush-border membrane: Membrane physical properties and glucose transport. Am J Physiol 1993; 264(6 Pt 1): G1009-15. Dean RT, Fu S, Stocker R, Davies MJ. Biochemistry and pathology of radical-mediated protein oxidation. Biochem J 1997; 324(Pt 1): 1-18. Gardner AM, Xu FH, Fady C, et al. Apoptotic vs. nonapoptotic cytotoxicity induced by hydrogen peroxide. Free Radic Biol Med 1997; 22(1-2): 73-83. Savu O, Ionescu-Tirgoviste C, Atanasiu V, Gaman L, Papacocea R, Stoian I. Increase in total antioxidant capacity of plasma despite high levels of oxidative stress in uncomplicated type 2 diabetes mellitus. J Int Med Res 2012; 40(2): 709-16. Mudau M, Genis A, Lochner A, Strijdom H. Endothelial dysfunction: The early predictor of atherosclerosis. Cardiovasc J Afr 2012; 23(4): 222-31. Jimenez-Del-Rio M, Velez-Pardo C. The bad, the good, and the ugly about oxidative stress. Oxid Med Cell Longev 2012; 2012: 163913. Squier TC. Oxidative stress and protein aggregation during biological aging. Exp Gerontol 2001; 36(9): 1539-50. Castellani RJ, Moreira PI, Perry G, Zhu X. The role of iron as a mediator of oxidative stress in Alzheimer disease. Biofactors 2012; 38(2): 133-8. Shukla V, Mishra SK, Pant HC. Oxidative stress in neurodegeneration. Adv Pharmacol Sci 2011; 2011: 572-634. Portelli M, Matarese G, Militi A, Nucera R, Triolo G, Cordasco G. Myotonic dystrophy and craniofacial morphology: Clinical and instrumental study Eur J Ped Dent 2009; 10(1): 19-22. Cordasco G, Portelli M, Militi A, et al. Low-dose protocol of the spiral CT in orthodontics: Comparative evaluation of entrance skin dose with traditional X-ray techniques. Prog Orthod 2013; 14: 24. Portelli M, Gatto E, Matarese G, et al. Unilateral condylar hyperplasia: diagnosis, clinical aspects and operative treatment. A case report. Eur J Paediatr Dent 2015; 16(2): 99-102. Prati C, Chersoni S, Lucchese A, Pashley DH, Mongiorgi R. Dentin permeability after toothbrushing with different toothpastes. Am J Dent 1999; 12(4): 190-3. Lucchese A, Storti E. Morphological characteristics of primary enamel surfaces versus permanent enamel surfaces: SEM digital analysis. Eur J Paediatr Dent 2011; 12(3): 179-83. Silness J, Loe H. Periodontal Disease In Pregnancy. Correlation Between Oral Hygiene And Periodontal Condition. Acta Odontol Scand 1964; 22: 121-35. St John KR. Biocompatibility of dental materials. Dent Clin North Am 2007; 51(3): 747-60. Valko M, Morris H, Cronin MT. Metals, toxicity and oxidative stress. Curr Med Chem 2005; 12(10): 1161-208. Lucchese A, Carinci F, Brunelli G, Monguzzi R. An in vitro study of resistance to corrosion in brazed and laser-welded orthodontic appliances. Eur J Inflammation 2011; 9(3): 67-72. Limberger KM, Westphalen GH, Menezes LM, Medina-Silva R. Cytotoxicity of orthodontic materials assessed by survival tests in Saccharomyces cerevisiae. Dent Mater 2011; 27(5): e81-6. Kao CT, Ding SJ, Min Y, Hsu TC, Chou MY, Huang TH. The cytotoxicity of orthodontic metal bracket immersion media. Eur J Orthod 2007; 29(2): 198-203. Freitas MP, Oshima HM, Menezes LM, Machado DC, Viezzer C. Cytotoxicity of silver solder employed in orthodontics. Angle Orthod 2009; 79(5): 939-44. Lucchese A, Matarese G, Ghislanzoni LH, Gastaldi G, Manuelli M, Gherlone E. Efficacy and effects of palifermin for the treatment of oral mucositis in patients affected by acute lymphoblastic leukemia. Leuk Lymphoma. 2016; 57(4): 820-7. Assad M, Chernyshov A, Leroux MA, Rivard CH. A new porous titanium-nickel alloy: Part 1. Cytotoxicity and genotoxicity evaluation. Biomed Mater Eng 2002; 12(3): 225-37. Lucchese A, Manuelli M, Bassani L, et al. Fiber reinforced composites orthodontic retainers. Minerva Stomatol. 2015 Dec;64(6):323-33. Spalj S, Mlacovic Zrinski M, Tudor Spalj V, Ivankovic Buljan Z. In-vitro assessment of oxidative stress generated by orthodontic archwires. Am J Orthod Dentofacial Orthop 2012; 141(5): 583-9. Eliades T, Athanasiou AE. In vivo aging of orthodontic alloys: Implications for corrosion potential, nickel release, and biocompatibility. Angle Orthod 2002; 72(3): 222-37. Buljan ZI, Ribaric SP, Abram M, Ivankovic A, Spalj S. In vitro oxidative stress induced by conventional and self-ligating brackets. Angle Orthod 2012; 82(2): 340-5. Roncati M, Lucchese A, Carinci F, et al. Non-surgical treatment of peri-implantitis with the adjunctive use of an 810-nm diode laser. J Indian Soc Periodontol. 2013 Nov;17(6):812-5 2015; 2015: 943839. doi: 10.1155/2015/943839. Epub 2015 Dec 21. Pérez-Navero JL, Benítez-Sillero JD, Gil-Campos M, Guillén-del Castillo M, Tasset I, Túnez I. Changes in oxidative stress biomarkers induced by puberty. An Pediatr (Barc) 2009; 70(5): 424-8. Lo Giudice A, Nucera R, Matarese G, et al. Analysis of resistance to sliding expressed during first order correction with conventional and self-ligating brackets: An in-vitro study. Int J Clin Exp Med 2016; 9(8): 15575-81. Kennedy M. Hormonal regulation of hepatic drug-metabolizing enzyme activity during adolescence. Clin Pharmacol Ther 2008; 84(6): 662-73. Cicciù M, Bramanti E, Matacena G, Guglielmino E, Risitano G. FEM evaluation of cemented-retained versus screw-retained dental implant single-tooth crown prosthesis. Int J Clin Exp Med 2014; 7(4): 817-25. Danza M, Zollino I, Avantaggiato A, Lucchese A, Carinci F. Distance between implants has a potential impact of crestal bone resorption. Saudi Dent J. 2011 Jul;23(3):129-33. Lucchese A, Bertacci A, Chersoni S, Portelli M. Primary enamel permeability: A SEM evaluation in vivo. Eur J Paediatr Dent 2012; 13(3): 231-5.